Painting "en plein air" is the fancy French way of saying "painting outdoors". 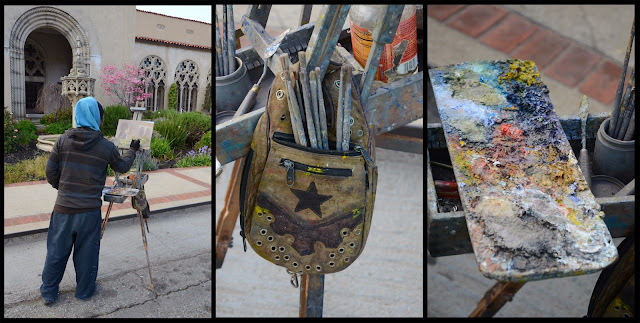 But whatever you call it, I've seen people painting near Lake Merritt, in Joaquin Miller Park, and in Mountain View Cemetery, but this was the first artist I've seen painting outside nearby Chapel of the Chimes. Speaking of Mountain View Cemetery, they're holding their annual tulip festival this weekend. Whether you check out the special displays in the chapel or just admire the flowers outside on the cemetery grounds, it's well worth a trip to see. Read about last year's tulip festival. I don't know. It seems unlikely, since people walk, jog, cycle, etc. there all the time. But if you want to check, the number of the office is (510) 658-2588.